Pregestimil Lipil is an iron-fortified, lactose-free, sucrose-free, hypoallergenic infant formula with 55% of the fat from medium-chain triglycerides (MCT) oil. Pregestimil Lipil includes Lipil, our blend of docosahexaenoic acid (DHA) and arachidonic acid (ARA), nutrients also found in breast milk. Increased level of choline to be closer to the level found in breast milk. Choline is an essential nutrient found in breast milk that, like DHA, is important for baby's brain development. Pregestimil Lipil is designed for infants who experience fat malabsorption and who may also be sensitive to intact proteins. Fat malabsorption or steatorrhea may be associated with cystic fibrosis, short bowel syndrome, intractable diarrhea, and severe protein calorie malnutrition. Pregestimil Lipil is also appropriate for infants with galactosemia. Pregestimil Lipil Ingredients: Corn syrup solids (34%), casein hydrolysate (from milk)|| (16%), medium chain triglycerides (MCT) oil (15%), dextrose (10%), modified corn starch (9%), soy oil (7%), corn oil (3%), high oleic vegetable oil (safflower or sunflower) (2%), and less than 2%: Mortierella alpina oil,¶ Crypthecodinium cohnii oil,# acetylated monoglycerides, vitamin A palmitate, vitamin D3, vitamin E acetate, vitamin K1, thiamin hydrochloride, riboflavin, vitamin B6 hydrochloride, vitamin B12, niacinamide, folic acid, calcium pantothenate, biotin, ascorbic acid, choline chloride, inositol, calcium citrate, calcium phosphate, magnesium oxide, ferrous sulfate, zinc sulfate, cupric sulfate, sodium iodide, sodium citrate, potassium citrate, potassium chloride, sodium selenite, L-cystine, L-tyrosine, L-tryptophan, taurine, L-carnitine. 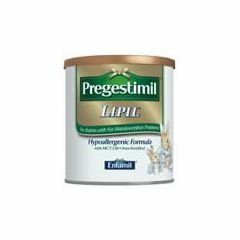 Can I get A coupon for pregestemil lipil?